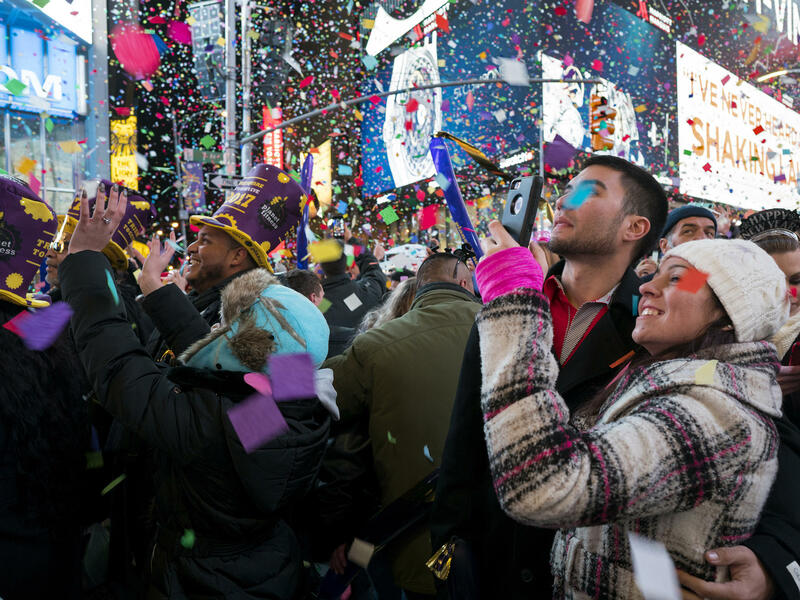 Crowds will gather again for New Year's Eve celebrations in New York's Times Square, but Twitter has other suggestions for midnight entertainment. If Guy Lombardo's rendition of "Auld Lang Syne" — the night's traditional chestnut — is too stodgy, some more upbeat suggestions popped up. Those include Death Cab for Cutie's "The New Year," Toto's "Africa" and Tina Turner's "The Best." If livening up your goodbye to 2017 isn't exactly what you had in mind, fear not. Twitter has you covered, too. Several fans of the avant-garde suggest cueing up the Zen-inspired John Cage masterpiece "4'33." As in, the most famous 4 1/2 minutes of silence ever composed — maybe something to help you snooze into 2018, if you like. Have a musical moment you think should ring out at midnight tonight? You can send us suggestions on Twitter @NPRWeekend. NPR's Isabel Dobrin in Digital News produced this story for the Web. FRAYER: If Guy Lombardo's rendition of "Auld Lang Syne" is decidedly, well, stodgy, Phil Collins sent out a tweet earlier this month to liven things up. He wrote (reading) if you play "In The Air Tonight" by Phil Collins on December 31 at 11:56:40, the drum break will play right as the clock strikes midnight. Start off your new year right. PHIL COLLINS: (Singing) I can feel it coming in the air tonight, oh, Lord. FRAYER: True 2017 fashion, a tweet led to a meme, and the Twitterverse lit up with other suggestions of climactic musical moments. George Slater thought this one from Death Cab For Cutie was appropriate. DEATH CAB FOR CUTIE: (Singing) So this is the new year, and I don't feel any different. FRAYER: Ronnie Sloan is evidently a Toto fan and urges people to queue up this song to ring out at midnight. FRAYER: And how about a blast of personal uplift? Tina Turner suggests giving yourself a pat on the back with her song, "The Best." TINA TURNER: (Singing) You're simply the best, better than all the rest. FRAYER: Several fans of the avant garde suggested queuing up the Zen inspired John Cage masterpiece "4'33"." Here is an excerpt. FRAYER: Yes, that's from the most famous four and a half minutes of silence ever composed. Maybe something to help you snooze into 2018 if you like, unless, of course, you're kept awake by the revelry outside. FRAYER: What musical moment do you think should ring out at midnight tonight? Send us your suggestions - @NPRWeekend - and have a happy new year. Transcript provided by NPR, Copyright NPR.